I was inspired to make this chili by my friend Tara..."PHENOMENAL" she said. While I ended up making my own version of it, I really loved that the flavors of the chili were different than my tried and true standby. While I imagine that regular chili is probably a pretty healthy supper choice, the lean protein and extra veggies make it even more so. And the colors are just gorgeous. In a large pot over medium-high heat, drizzle a couple tbsp of oil. Add turkey and cook about 5 minutes, breaking up into crumbles as you cook. Add chili powder, cumin, grill seasoning, Worcestershire, liquid smoke, chipotle hot sauce and chili flakes. After the turkey has cooked for 5 minutes add onion and carrot and continue to cook another 5 minutes or so. The add the beef broth to deglaze the pan, making sure to scrape up the good bits on the bottom. Add the tomatoes, tomato sauce, BBQ sauce, peppers, corn and beans. Let the chili simmer for at least half an hour, stirring every so often. 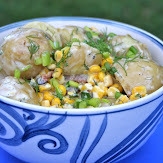 To serve, scoop into bowls and add chopped green onions over the top. This was delicious. It was a nice change from ordinary chili. I do have one thing to say about the turkey though: I couldn't even tell it was turkey. Which can be a good thing if a) you want to eat healthier but are used to ground beef and/or b) you can't afford the extra price for ground turkey so you make this with beef instead. Beef, turkey...this chili is good all the same. For more interesting recipes, check out Gayle's Recipe Swap at Grocery Cart Challenge. Sounds delicious! I can't wait to try it.